She entered the national spotlight as an author of a 1955 report to President Dwight D. Eisenhower that said 56 percent of American children had failed at least one of a battery of fitness measures, including leg lifts and toe touches. By contrast, only 8 percent of European children had failed even one test component. The study came to be referred to as “the report that shocked the president,” who worried that slack American youth would make less-than-intimidating soldiers. It resulted in the creation of the President’s Council on Youth Fitness, now the President's Council on Fitness, Sports and Nutrition. Ms. Prudden believed the cause was children lollygagging in front of the television and not walking to school or performing old-fashioned chores. 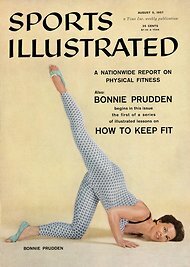 She became one of the first exercise instructors on television, appearing as a guest on the “Home” and “Today” shows on NBC in the 1950s, and then on a syndicated show named for her in the 1960s. She wrote fitness articles for Sports Illustrated. She recorded a half-dozen records and wrote 15 books. She never stopped exercising. Even triple bypass heart surgery at 92 did not hinder her daily routine, by then largely done in the swimming pool or in bed, for which she had devised a set of rigorous exercises. Bonnie died on December 11th at the age of 97.